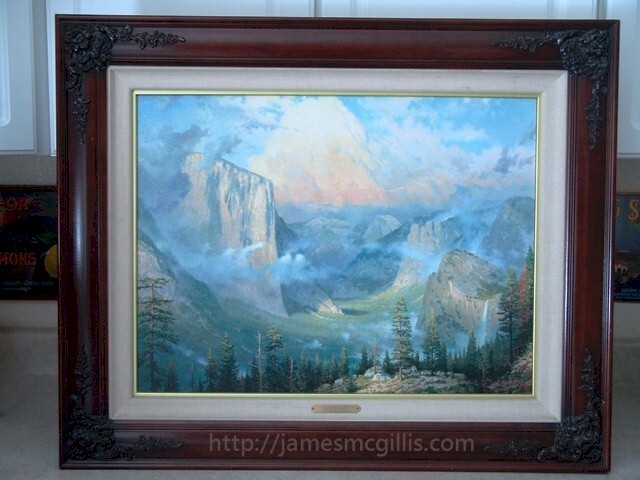 For years, a hand-retouched, signed and numbered, Thomas Kinkade 1992 cotton-fiber artist’s canvas print of “Late Afternoon Light at Artist’s Point, Yosemite Valley” hung in our hallway. With its dark location and short viewing distance, I often passed it by without notice. When some filigree scrollwork on the Brandy frame required repair, for the first time in almost a decade, I brought the 18" X 24" canvas into the light. 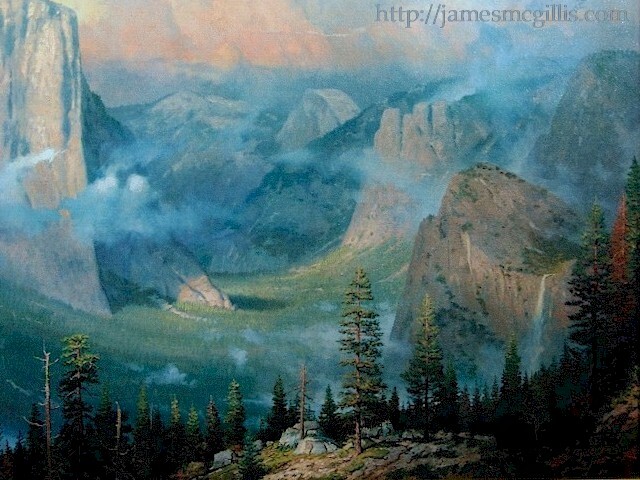 Regarding the original painting, Thomas Kinkade wrote, “Nowhere on Earth am I more aware of the sheer awesomeness of God’s handiwork than Yosemite Valley. This painting depicts the valley as seen from the little known place called ‘Artist’s Point’, named in tribute to the many 19th century artists who favored it as a sketching ground. In 1989, the National Park System selected ‘Yosemite Valley’ as their official print. I was thrilled with the honor, but after all, God alone deserves the credit for the beauty and majesty of Yosemite Valley”. On the back of our frame, I found a Collector Fact Sheet and a Certificate of Authenticity. Our Kinkade is “No. 533/980 sn Canvas”. 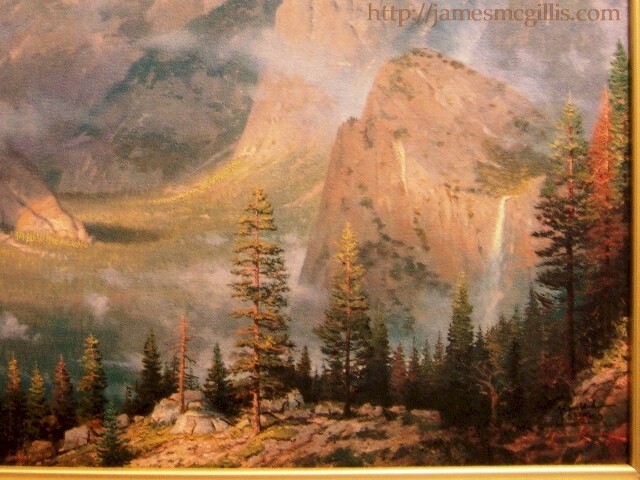 On the lower right corner of the print is the lithographed signature of Thomas Kinkade (1958-2012). Below that, hand-signed is the unintelligible signature of the artist who highlighted our canvas in oil. The net effect is a canvas print that looks like an original Kinkade oil painting. Although a Master’s Canvas Edition of twenty hand retouched, signed and numbered prints was available in 1992, Kinkade’s own retouch and signature in oil made them too expensive for us at that time. In comparing our “sn” print with a Master’s Canvas Edition, the two look uncannily alike. That was part of Kinkade’s appeal. Through the economy of scale, and with added handiwork, Kinkade marketed “original art” at affordable prices. Since Kinkade personally trained all of his retouch artists, each of them retouched within the master’s concept. Thus, a well-kept “sn” can look every bit as good as Kinkade’s highest price offering at the time. 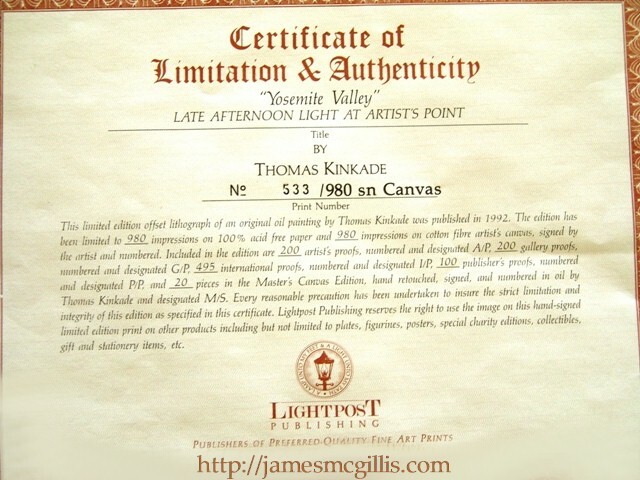 With Kinkade’s original art often retained in his own collection, lithographs and canvas prints are the only way for most of us to own a “Thomas Kinkade Original” painting. With its customary dryness, Wikipedia describes Thomas Kinkade thus: “Thomas Kinkade was an American painter of popular realistic, bucolic, and idyllic subjects. He is notable for the mass marketing of his work as printed reproductions and other licensed products via The Thomas Kinkade Company”. 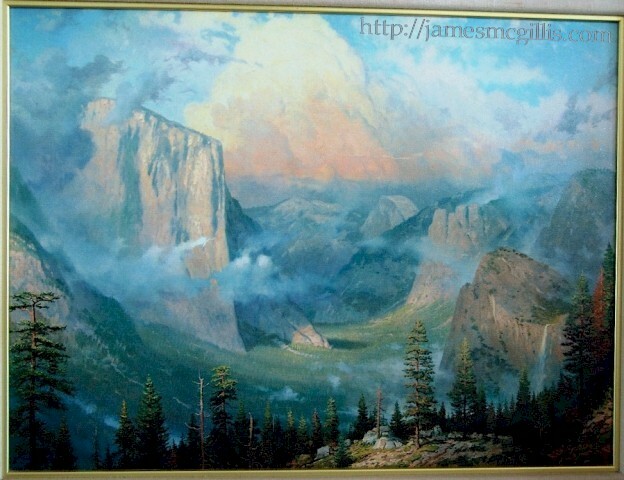 After examining our own Thomas Kinkade “Yosemite Valley”, I could see both sides of the Thomas Kinkade legacy. Upon close examination, our Kinkade is indeed a hand retouched canvas print. Yet, when I photographed the print in natural light, it became a painting before my eyes. In the warm light of afternoon, the canvas shone with yellow, orange and brown. In later light, the sunlight faded and the Alpenglow of sunset displayed upon the clouds behind. With fuller light, the painting exhibits "morning light". How one canvas could take on so many different visual aspects was at first a mystery to me. Then I remembered that early in his career, Thomas Kinkade had dubbed himself, “The Painter of Light”. Although the moniker had sounded pretentious to me at that time, my story is different now. I realize now that even a reproduction of Kinkade’s work can reflect light in interesting ways. With my renewed interest, our Thomas Kinkade now hangs lighted, in a place of honor on our walls. With a collection of other paintings now crowding our wall space, we decided to sell our Thomas Kinkade to an appreciative new owner. With only nine hundred eighty original canvas prints of the “sn” type ever produced, our “Late Afternoon Light at Artist’s Point” has since moved to grace the walls of a happy new owner.